This page covers wireless sniffer basics with block diagram. It mentions manufacturers of wireless sniffer used for wifi, bluetooth, zigbee, zwave, lte, gsm, IoT wireless packet analysis. The figure-1 depicts wireless sniffer used to sniff wifi signals in a wlan/wifi network. As shown it can be used to sniff or analyze wlan packet exchanged between AP (Access Point) and STAs (Stations). There are two types of analyzers offline and online. The offline applications are used to analyze offline stored data. They come as standalone applications and do not require any RF hardware. They can be installed in any desktop or laptop. The online applications run in the hardware consisting of RF, ADC, memory and other necessary hardware components. The online applications can be used to analyze over the air (OTA) wireless packet. Hence online application with required hardware is known as wireless sniffer which analyzes OTA packet. Typically Wireless sniffer is composed of RF receiver, ADC, memory and microprocessor/microcontroller. The RF receiver converts received RF signal to baseband signal. The baseband signal is converted from its analog form to the digital form which is written in the memory by microprocessor/microcontroller. 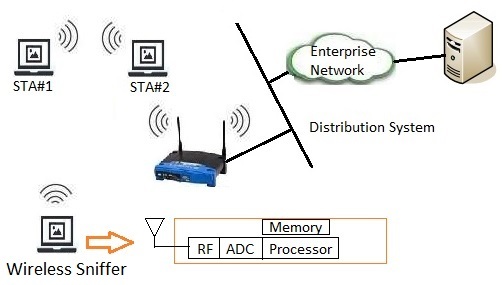 The samples written into memory are being analyzed by appropriate baseband application as per standard device requirement such as WLAN, Zigbee, Bluetooth etc. For example, to sniff wifi signal, wifi based wireless sniffer is needed and to sniff bluetooth signal, bluetooth based wireless sniffer is needed and so on. Following table mentions wireless sniffers for wifi, bluetooth, LTE, GSM, Zigbee and Zwave.